Welcome to Craf-TAY Corner, the monthly feature that showcases the creative side of Talk Amongst Yourselves and let people talk about their crafty hobbies and show off their latest projects. Last month was 'Finish Everything Before the Year Ends Month' where I offered the challenge of finishing projects that have been languishing for a while before the Holiday season starts and we run out of time. A challenge I failed most spectacularly and didn't get a single one of my presented WIP projects done. I have a good reason for that, mostly because I've been working my proverbial tail off getting the second volume of my series The Sorcerer's Apprentice done. All those pages in the header image are ones I've been working on just in the past few days alone. I'm very close to finishing it now, but I haven't had much time for anything else. 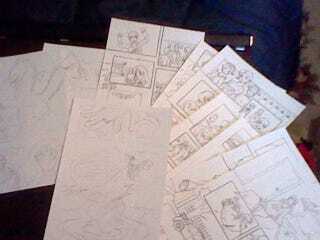 Since I blew my own challenge, instead, I'm going to show you something else that's pretty cool: how I draw my pages. Fortunately, my failures have been countered by the fact that people actually have been finishing their projects. Astro showed off her amazing OC cosplay dress that is very snazzy, and Stormborn continues to impress with his latest series: redesigning Mario Bros. Being that it's the end of the year, what projects have you gotten done this year? While I sorta bombed on working those dolls and cross stitch, I actually got quite a lot done this year creatively. I did a ton of prints and commissions for the two Artist Alleys I've done this year, have worked consistently on 3 web comics, and I'm very close to completing my second graphic novel. If you do anything crafty and post it on your Kinja blog or on TAY, don't forget to tag it 'Craf-Tay Corner' so I can feature it in next month's edition.